I’ve been using the Nokia Steel HR watch for about a week. It’s been fun to see new data that I normally wouldn’t have access to. It’s got quite a few really fun features, but still maintains the look of a classic watch. While I appreciate the default classic black silicone band, I think it’s wonderful that you can purchase a classier band on the website. I’m eyeing the brown leather option. The watch has a battery life of 25 days, which is great if you already have enough devices to charge regularly, It’s super simple to setup using the health mate app on the phone, where you can also monitor your data and join fun programs hosted by Nokia health. This information can also be accessed through their desktop website. Pretty neat! There’s also compatibility for some of the apps you’ve already fallen in love with. Strava anyone? I have pretty basic standards when it comes to watches, I like them to have a simple enough aesthetic that I can wear it with anything, be waterproof because I have a really hard remembering to remove my watch before I shower, and the ability to tell the date and time. The Nokia Steel HR checks all the boxes. It also allows for features like counting steps, checking your heart rate, monitoring your sleeping patterns, storing a daily alarm, and counting your daily mileage. Another fun addition is the analog dial that tracks the progress towards a daily goal of steps that you can set in the health mate app. The one feature that I have been taking for granted is the on screen pairing for your phone calls and text messages. It’s nice to keep my phone on silent and have a quiet unmissable buzz on my wrist when a call or text is coming through. It also let’s you know who’s reaching out! There are other similar devices on the market, but most of them have so many bells and whistles that I likely wouldn’t have use for half of the features. 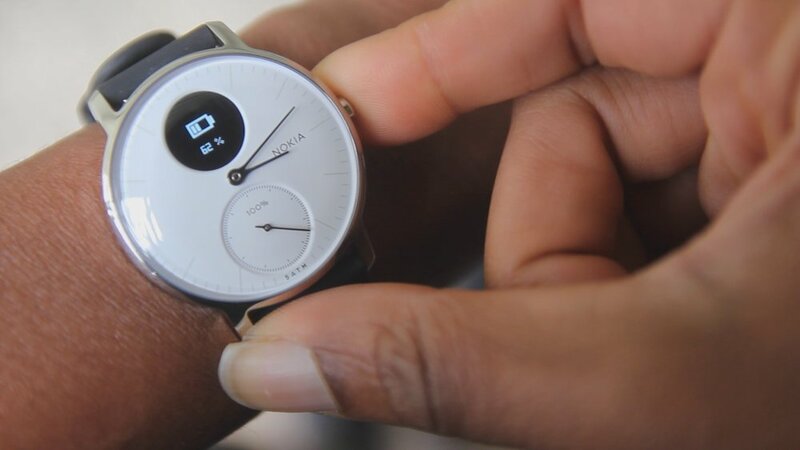 I appreciate Nokia’s bare necessities (plus a few luxuries) approach to wearable technology. It works for me.